Built in the early 1890s, this modest little house has changed little in its nearly 115 years. As land was being cleared for the Alamodome, someone took notice (or pity) on this tiny abode that was slated for demolition. Just in the nick of time, it was declared "historically significant" by the San Antonio Office of Historic Preservation and instantly became a problem (to the developers) out of porportion to it's size. 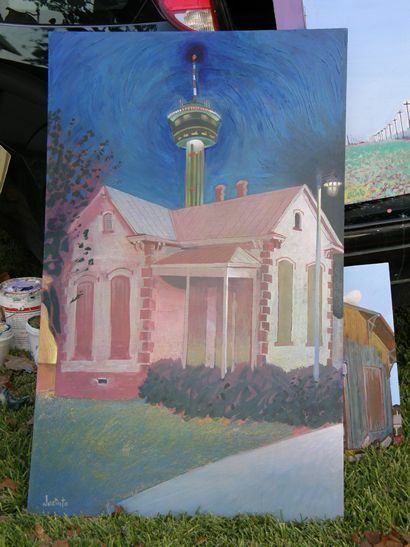 In an article by Paula Allen in the San Antonio Express-News, the house is identified as the Roatzsch-Griesenbeck House and the (former) address is given as 123 Nevada Street. The lot had been purchased from the city in the 1850s and went through a series of owners. Four decades later August H. Roatzsch purchased the lot and built the house. August was listed in the city directory as a carpenter. It was sold in 1901 to Arthur Griesenbeck, who supplies the second half of the house's name. The simple utilitarian design was typical of the period, with no driveways or garages to consider. Excavations for the dome allowed the land to be examined by archaeologial teams who didn't uncover anything "overly significant" but were able to determine the cultural changes of the neighborhood. Over the years, the population shifted from Germans to Poles to Mexicans and African-Americans. The house's various occupants were working-class or tradesmen and included bricklayers and at least one barber. 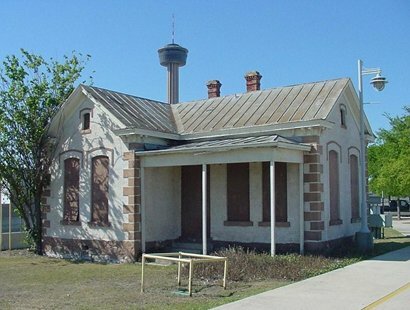 The proximity to downtown and the Alamo Iron Works (the company who had owned most of the land the dome now occupies) insured that the house was seldom, if ever, vacant. Here it sits, piquing the curiosity of those passing by. As of this writing (October, 2007) there�s no sign to explain its presence, let alone a historical marker. There has been talk of converting it into an office for Alamodome employees, but that remains to be seen. Impressed by the modest cottage, San Antonio artist Jacinto Guevara took time out from his current project of painting railroad depots to capture the Roatzsch-Griesenbeck House in oil.